/ Events / Harry Potter Trivia Night is November 14th! 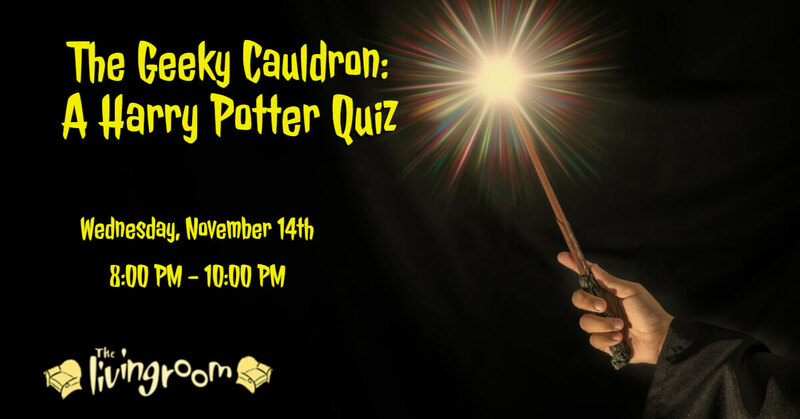 Dear quizzer, we are pleased to inform you that you have been accepted to attend The Geeky Cauldron: A Harry Potter Quiz. Please find enclosed a list of all necessary information and equipment. Quiz begins on November 14th. We await your owl by no later than… actually, please send no owls. Just go to the quiz. Owls are dangerous wild animals. Cheaters will be subjected to the Cruciatus Curse if they are found using self-correcting ink, spellchecking quills or any dishonorable Muggle devices. The quiz will have equal portions questions about the books and the movies and we’ll also be asking a smattering of questions about The Cursed Child, Fantastic Beasts and other stories set in the Potterverse to separate the contenders from the pretenders. You better break out your Timeturners as you’ve got quite a lot of material to cover. Perhaps your local apothecary shop has powdered dragon horn? Make sure you visit Gringotts before the quiz, as admission is 8 sickles, 13 knuts. We will accept Muggle money, of course, so that comes to $5 per person. Winners will be awarded a fat purse (trust us, it will not be leprechaun gold). Your team is limited to 6 wizards and you might want to come prepared with more than one team name. You’re not the only ones who picked “You’re a Quizzard Harry”.